We’ve said it before and we will say it again… when premium Rum is aged in the tropics for a LONG time, it turns red. Well, not “red” as in “garish Vegas neon red.” More like, “garnet gemstones have been somehow magically dissolved into the spirit at sunset” kind of red. Centenario Fundacion 20YO Seleción Premium is just that kind of red. Perfecto. And something else about really old Rum… it gets oh-so-smooth. The transformation of Rum is far more dramatic than most other spirits. Fresh “white” Rum is unaged and can drink like diluted Riccola throat lozenges. But by the time the best Rums get to 20 long years resting in oak at the high humidities of the tropics, what comes out of the cask is altogether different. Seriously… give this one a try. 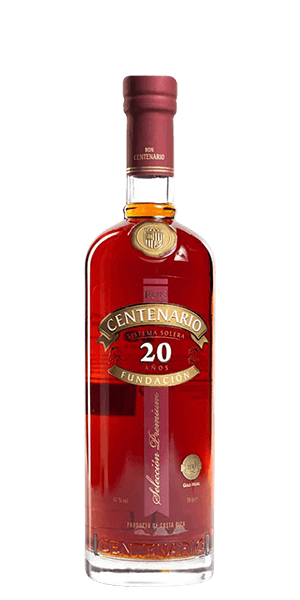 What does Ron Centenario Fundacion 20 Year Old Seleción Premium taste like? The Flavor Spiral™ shows the most common flavors that you'll taste in Ron Centenario Fundacion 20 Year Old Seleción Premium and gives you a chance to have a taste of it before actually tasting it. Solid choice. Though not as spectacular as the 30 or 25 yr. Looking form Ron Centenario 25. Can you obtain it? It apparently hard to find, and I have searched all over So Cal and AZ even online on the East Coast, Texas, Florida. Can you help? I've had the 20 and it's excellent, but the 25 is still far smoother, and much more flavorful. One of the best rum ever made! Rum at it's best.......right color, right age and right flawor. You won't be disapointed.